If you own a website, chances are that you need to use a database to run many site operations. For the most part, people use MySQL. Most hosts offer a solution to manage your database. A common choice for this is phpMyAdmin. But, for many, phpMyAdmin can be slow or feel bloated on slower connections. Then, there is the group of people who aren't offered the luxury of phpMyAdmin or even SSH. There is no way to access the database unless you install your own software. I was one of those unlucky people working on an unnamed server without a MySQL management area. At first, I tried to install phpMyAdmin. While powerful, it is a massive download and takes a lot of configuration to get working. I googled for a PHP MySQL manager. One of the results that I got was a sweet little app called tinyMy. The front page greets you with a simple login box. I typed in my database username and password, and it instantly opened and showed all of my databases. I clicked on a database and table, and it listed the structure and contents. This was the perfect lightweight solution I needed. The only caveat with the script is the fact that there is no GUI interface for managing tables and fields, only to view. You will need to know MySQL to manage the database, but if you have the MySQL documentation ready it should not be a problem. 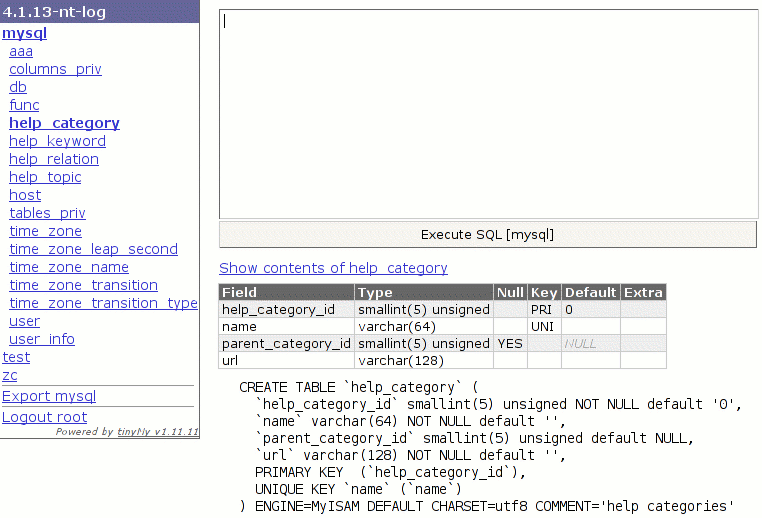 If you are a MySQL user who needs a way to manage your databases from the web, then this application is perfect for you. At 7 KB, how can you go wrong?